Media titan Rupert Murdoch is showing his love for China by posting gushing messages about the country on the popular social media site, Weibo. And the Chinese are loving him back. Over 45,000 people quickly opted to "follow" his new Weibo account after he began using the site in China on Sunday. The billionaire used Weibo -- China's version of Twitter (TWTR) -- to announce that he had just met Chinese President Xi Jinping. Xi, who will make his first state visit to the U.S. this week, told Murdoch that he would continue to open up the country to foreign media. Murdoch also posted about his meeting with Lei Jun, who founded Xiaomi, the world's third largest smartphone maker. He said he received a large 'goody bag' filled with Xiaomi items that he planned to try out. Both posts were written in Chinese. A look at Rupert Murdoch's new Weibo account. Murdoch then issued a series of English posts on Weibo. In one, he said he was looking forward to flying home to be with his "two beautiful Chinese daughters," children from his marriage to ex-wife Wendi Deng. And then he bemoaned the boring food in New York. "Wonderful Chinese food in Beijing. Now back to boring diet in NY," he wrote. "Any suggestions for places with real Chinese food?" Related: What is China's president doing in Seattle? His latest message complimented Beijing on its airport while taking a swipe at crumbling infrastructure in the U.S.
"Leaving great Beijing airport - reminder of abandoned third rate US infrastructure. Hopeless planning and wrong priorities." 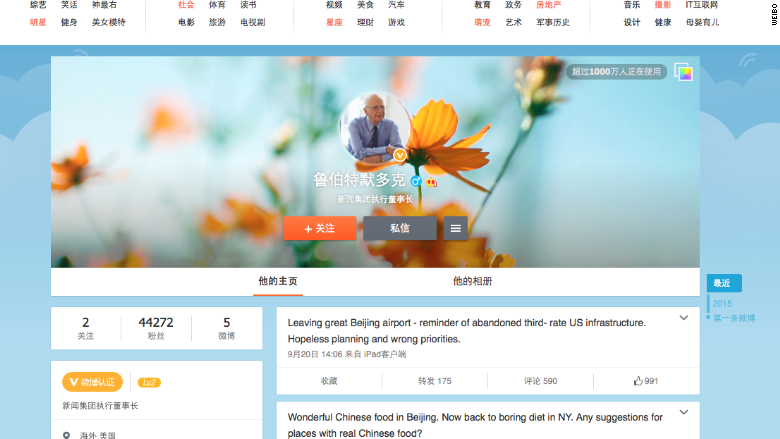 The 84-year old billionaire is not the first high-profile Western executive to open a Weibo account. Apple (AAPL) CEO Tim Cook published his first post on Weibo in May and has since racked up over 710,000 followers. 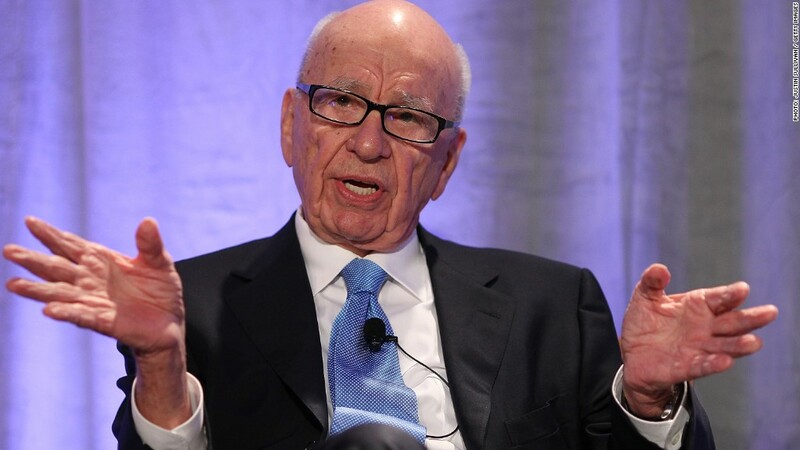 Murdoch has spent decades building a global media empire that includes 21st Century Fox (FOX) and News Corp (NWS). He recently elevated his sons -- James and Lachlan -- to top positions at 21st Century Fox. Murdoch is very active on Twitter and has roughly 618,000 followers. He frequently tweets about American politics and business issues. --Sophia Yan and Pamela Boykoff contributed to this report.